Though women buy more than 50 percent of autos sold in the U.S., the number of women who sell them is far less. Women who own dealerships, like Northampton’s Carla Cosenzi, are even scarcer. Cosenzi, along with her brother, owns Country Nissan in Hadley, Country Hyundai and Northampton Volkswagen, both in Northampton. The face of the businesses started by her father — gracing their television ads for years — Cosenzi has expertly navigated the rapidly changing the auto sales industry. But working with cars was not actually the road she planned on taking. “I never really saw myself as getting involved in the family business. I wanted to make my own path,” she said. After graduating from Northeastern University she went on to earn a Masters in Clinical Psychology from Columbia, and saw herself working in the research field. But when her dad convinced her to work for him while she sorted out her career plans, the then 24-year-old found herself surprised. “I fell in love with the business. I loved selling. I loved that it was so unexpected to have this young female on the sales floor. It made the experience of buying a car different than they expected, and for me, it just kind of clicked,” she said. Cut to 15 years later, and Cosenzi is President of TommyCar Auto Group, running three dealerships and overseeing 105 employees. She’s not only working in a business heavily dominated by men, she’s leading it. Cosenzi, who is mom to 4-year-old daughter Talia and 2-year-old son Niko, said having children has impacted the way she runs her business, giving her a newfound “balance.” Motherhood has provided her with a different appreciation for her employees who have kids, and has inspired her to find new ways to give back. The charitable arm of her business, Carla Cares, supports non-profit organizations and causes across the region, provides scholarships and has a presence at community events. Their annual golf tournament, in memory of Cosenzi’s father, Tom, has raised more than $830,000 for Dana-Farber Cancer Institute. Cosenzi admits it can be a challenge to strike the right work-life balance, but she hopes to be setting an example for her children – especially her daughter. We are honored and excited to share with all of you that we have won Best New Car Dealer for Valley Advocate's Best of the Valley! We could have not done this without the support from our amazing customers and the community. So thank you to everyone who voted for us and a huge CONGRATULATIONS to all the winners this year for Best of the Valley 2018! "NORTHAMPTON — Carla Cosenzi, president of TommyCar Auto Group, recently presented Jack Collins, director of the Northampton Veteran Affairs Medical Center, with a check for $1,480. All three of the TommyCar Auto stores, Northampton Volkswagen, Country Nissan, and Country Hyundai, held the same promotion throughout the entire month of November. For every car sold, each dealership would donate $10 to the Northampton Veteran Affairs Medical Center. The stores were able to raise a total of $1,480. “Our veterans have dedicated and sacrificed their lives to protect and keep our country safe. As a business owner, it’s my obligation to give back to our veterans when our veterans give so much,” Cosenzi said." The Tom Cosenzi Driving For The Cure Charity Golf Tournament was recognized in 2017 as one of Jimmy Fund's leading fundraising tournaments. The Tom Cosenzi Driving for the Cure Tournament had a record breaking year, raising over $125,000 in its 9th year for Dana Farber Cancer Institute. They're looking forward to topping their record amount as they prepare to hold their 10th annual tournament on August 20th, 2018 at Twin Hills Country Club in Longmeadow, MA! Carla Cosenzi president of TommyCar Auto Group was featured in MSDA Auto Dealer Magazine's October 2017 Charity Counts issue. The article highlighted both Carla's and TommyCar Auto's charitable contributions over the years. Carla speaks of continuing the legacy of her father and incorporating giving back to their community as part of the everyday culture within each of the dealerships. Pictured: Left to Right: Patrick Wen, MD, Director, Center for Neuro-Oncology Dana-Farber Cancer Institute; Tommy Cosenzi and Carla Cosenzi, Founders of the Tom Cosenzi Driving for the Cure Charity Golf Tournament. HADLEY — The Tom Cosenzi Driving for the Cure Charity Golf Tournament set a new fund-raising record by raising $131,300 to support Dr. Patrick Wen and his research colleagues in the Center for Neuro-Oncology at Dana-Farber Cancer Institute. The tournament was held on Aug. 21 at Twin Hills Country Club in Longmeadow and Elmcrest Country Club in East Longmeadow, followed by a dinner at Twin Hills Country Club attended by more than 300 guests. The dinner featured a performance by Noah Lis from The Voice along with John Dennis, celebrity emcee of the WEEI/NESN Jimmy Fund Radio-Telethon and featured a raffle and live and silent auctions. The event’s platinum sponsor was Edmunds. The tournament was started by Carla and Tommy Cosenzi, co-presidents of TommyCar Auto Group, to honor the legacy of their father, Tom Cosenzi, who passed away from a glioblastoma in 2009 and dreamed of a cure for brain cancer. What started as a small, four-team tournament in 2009 has grown to become one of the largest charity tournaments in Western Mass., with more than 52 teams and 300+ participants. 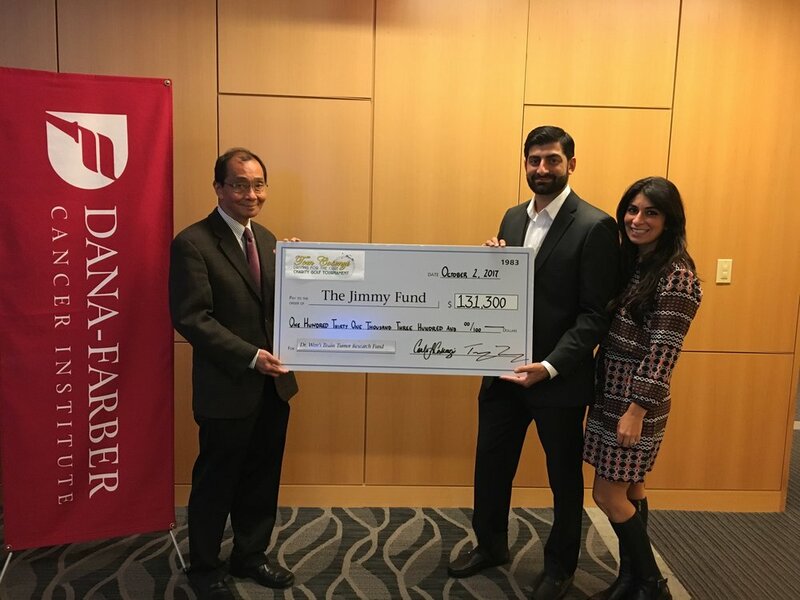 Proceeds from tournament sponsorships help Dana-Farber researchers design novel clinical trials to test and develop targeted therapies that have not previously been studied in brain tumors, initiate several clinical trials in immunotherapy, and conduct groundbreaking basic research to guide new therapeutic approaches. Since its inception in 2009, the Tom Cosenzi Driving for the Cure Charity Golf Tournament has donated $830,712. Visit tomcosenzidrivingforthecure.com for information about the 2018 tournament, which will mark the event’s 10th year. Carla Cosenzi says TommyCar Auto Group is seeing continued growth across all its lines, despite projections for an industry-wide downturn. Carla Cosenzi says sales have been on the rise for several years at TommyCar Auto Group, and she expects this trend to continue at its dealerships. "Meanwhile, Carla Cosenzi said last year was a great one for TommyCar Auto Group, which includes Hyundai, Nissan, Buick, GMC, and Volkswagen franchises. Some stores did especially well, including Hyundai, which experienced strong demand for entry-level vehicles. “Hyundai gives customers a lot of value for their dollar, including technology, safety, and the aggressive pricing people are looking for,” Cosenzi explained, noting that consumers are excited about the fact that new technology is standard in many brands of entry-level models and ranges from adaptive cruise control to lane assist, collision warning, and backup cameras. TommyCar is expecting another excellent year, and the sales of the new Volkswagen Golf All Trac station wagon, which has all-wheel drive, accelerated right after it was released. In addition, SUVs and crossovers are becoming increasingly popular, such as the 2017 seven- passenger Nissan Rogue and Volkswagen Tiguan. “People want the space, comfort, and luxury they provide. They are more expensive than compact cars, but with interest rates and gas at all-time lows. they’re affordable,” Cosenzi noted." "Northampton Volkswagen and Country Hyundai, two neighboring stores in TommyCar Auto Group, opened their doors in 2014 with a similar focus on the customer experience. People bringing their cars in for service are met with high-speed doors followed by a porter who shows the way to a waiting room decked out with a TV, wi-fi, business workstations, smartphone jacks, free drinks and snacks, and even complimentary bicycles outside in case customers would rather take to the nearby bike trails instead of waiting indoors. “We designed everything for the comfort and convenience of the customer,” said Carla Cosenzi, president of TommyCar. “We’re doing everything with the customer in mind.”"
SPRINGFIELD, MA (WGGB/WSHM) -It's important to be prepared for even the most unthinkable events, and that's why a 'Kidsafe' event is being held this weekend in Northampton. Carla Cosenzi from Country Hyundai and Northampton Volkswagen joined Western Mass News at 12:30 p.m. to tell us more. "HADLEY -- Tommy Car Auto Group awarded two students each with a $1,000 scholarship to attend college this fall. The Scholarship received an overwhelming number of applicants this year, totaling over 100 applications by local students. Jennifer Moss of Hopkins Academy will be attending University of Massachusetts. Olivia Kiritsis of Shepard Hill Regional High School will be attending Worcester Polytechnic Institute. Both students demonstrated excellence in the classroom and in the community." HADLEY- During November 23rd-25th, TommyCar Auto Group made a contribution of $3,000 to support the Rock 102 Mayflower Marathon. Country Hyundai, Country Nissan and Northampton Volkswagen matched the first $1,000 that was donated by listeners each day; donating a grand total of $3,000 to the Springfield Open Pantry. Plus, their service departments offered discounts on vehicle maintenance to anyone willing to donate non-perishable canned goods, according to a news release." "HADLEY- The Tom Cosenzi Driving for the Cure Charity Golf Tournament announced today that it has raised $103,000 to support Dr. Patrick Wen and his team of researchers in the Neuro-Oncology Department at Dana Farber Cancer Institute. In the last seven years, the tournament has raised more than half a million dollars. Due to the tremendous support that this years’ tournament brought, the tournament was expanded to Crestview Country Club and Oak Ridge Golf Club. This year the 4-player scramble attracted 220 golfers and 250 banquet guests. It included a full day of golf, dinner and a silent and live-auction in the evening. Autotrader was the event’s Platinum Sponsor." Carla Cosenzi says TommyCar Auto Group is planning major promotions to ensure that solid sales continue throughout the fall. "TommyCar Auto Group is also doing well. “Our sales are up over last year by quite a bit in every store, especially Hyundai,” said President Carla Cosenzi, adding that small crossover vehicles such as the Nissan Rogue and Hyundai Tucson have become big sellers, and she expects sales to remain high through the end of the year. “Although we expected an increase, we kept our projections conservative, but we have definitely outsold what we anticipated, and are looking forward to a really strong end of the month in September, October, and November,” she said. “A lot of people are beginning to think about the weather. As we head toward winter, they want to make sure they are in a safe, reliable car, and we will have great offers that should make a difference in our year-end sales. We have two major promotions that will start in October and run until January. We have revamped our strategy and are excited to roll it out.”"
TommyCar Auto Group consisting of Country Nissan, Country Hyundai and Northampton Volkswagen have been awarded 2015 Best New Car Dealer for the Valley Advocate Best of the Valley Reader’s Poll. For over thirty years, the people of Western Massachusetts have been making their voice heard by voting in the Valley Advocate's Best of the Valley Readers' Poll. From favorite automotive dealership to art museum and pizza place, to hair salon and dentist. Best of voters have been showing their support for those businesses that are an integral part of the fabric of their lives in the Pioneer Valley. Earning this award reflects the entire TommyCar Auto Group is committed to giving the best customer experience possible. “We want to ensure that our customers are satisfied not only at the time of purchase, but as long as they own their vehicle,” said Cosenzi. As a team, Carla and her brother Tommy work together through respect and communication to grow their father’s legacy. She attributes the success of their business to their dedicated employees, who have helped grow the business into the one it is today. "Carla Cosenzi doesn’t mince words when she talks about 2015 and her expectation that it will be a great year for auto sales. “The economy continues to gain strength, interest rates remain low, and there are a lot of exciting new models coming out, so the outlook is really positive; the auto industry is predicting a record year,” said the president of TommyCar Auto Group, adding that sales have been on the rise in the past few years and the company was confident enough to build brand-new Hyundai and Volkswagen dealerships in Northampton over the past few years." "HADLEY - Country Nissan has been awarded a 2015 DealerRater Consumer Satisfaction Award, the said according to a news release. Country Nissan has achieved consistently high marks on the DealerRater website, placing it among the top dealerships nationwide. "We want to ensure that our customers are satisfied not only at the time of purchase, but as long as they own their vehicle," said Carla Cosenzi, owner of Country Nissan. "The Dealer Rater Consumer Satisfaction Award is reflective of our long-standing commitment to create exceptional customer experiences. Exceeding customer expectations is not an easy task. However, this is exactly what we strive to do every day here at Country Nissan." "
HADLEY — TommyCar Auto Group was a supporter and sponsor of the Rock 102 Mayflower Marathon, with its Service Department offering discounts on vehicle maintenance to anyone willing to donate non-perishable canned goods. In addition to the generous community support, Country Hyundai, Country Nissan, and Northampton Volkswagen matched the first $1,000 that was donated by listeners each day, donating a grand total of $3,000 to Springfield Open Pantry. “It was inspiring to see how many people come out during those three days to donate non-perishable items. We were honored to be part of this amazing cause” said TommyCar co-owner Carla Cosenzi. This year, the annual Rock 102 Mayflower Marathon raised $108,000 for Springfield Open Pantry. Bax & O’Brien broadcasted 52 hours from the Basketball Hall of Fame in downtown Springfield. Their goal was to fill three 48-foot trailers with non-perishable food donations. 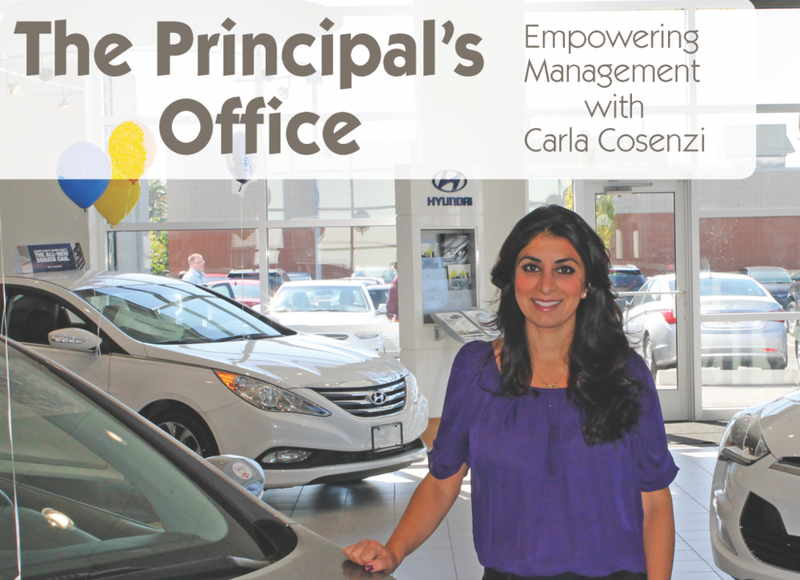 "One way that Carla acts to generate a culture of success for her dealership is through giving. She has branded herself using CarlaCares, a group of nonprofit organizations to which she donates and supports. However, this is not for personal gain, as she describes herself as having a passion for giving back to her community. The bonus is the attitude change for employees that see her level of commitment. Her passion for giving is contagious, as she is also completely committed to being on-site, in her stores, every single day. Such conviction inspires her employees to achieve more than most, all while having more pride in what they do than most." "Carla Cosenzi, President of TommyCar Auto Group, presents the seminar "How to Delagate and Empower Your Management to Drive Employee Success”"